Rob Marchant looks at just how free and fair the recent elections in Venezuela (won by Hugo Chavez) were, and how impartial the "election observers" were. This morning, news came in of Hugo Chávez’s not entirely unexpected win in Venezuela’s presidential election. Now, today is not the time to review the man’s record in office on areas such as the economy, human rights or foreign policy, although these things are important – but, from this election result hangs an illuminating tale of the British left. Despite Chávez’s regular use of state TV for campaign broadcasts, and concerns about voter intimidation, he has always gone out of his way to preserve at least an appearance of democratic choice to his electorate. The problem was, that with its hi-tech thumbprint identification, many voters were frightened away from using it, worrying their details might be used to find out how they voted (by the way, just think about how civil liberties groups would react to a national database of thumbprints in the UK). This time, though, Chávez didn’t even try that hard to keep up appearances. For the first time this election, there was no official, institutional election observation (EU, UN, and so on) other than the Union of South American Nations (UNASUR), a relatively new organisation rather dominated by Chávez and his friends among South American leaders. His supporters have recently become fond of quoting President Jimmy Carter of the Carter Centre, who praised their voting process. They fail to say other vital things outside the technical voting mechanism, such as media access, were criticised and remain unaddressed. And, whether or not Carter was right, this time he was unwisely making a statement on Venezuela’s fairness without actually having sent observers; the Carter Centre, the only other 2012 invitee, rejected its invitation, sent only two months before the election, and no other institution was even invited. It was also the first important election which he had a chance of losing (the only other which came close was a referendum about abolishing presidential term limits in 2007, but Chávez just kept right on going, until he got the answer he wanted two years later); no, this time it was UNASUR alone, and Chávez was left with a conundrum: how to lend credibility to elections in which it was sorely lacking? Step forward, a few hundred helpful individuals from abroad, invited to “observe”. Now, we do not know whether people leaning towards Capriles balanced out in number those leaning towards Chávez. But the idea a few hundred individuals, however they might be chosen, can substitute for bona fide, independent electoral observation by a respected institution is absurd. Think: why would a democrat want to abolish term limits on a presidency, if not to cling to power? Why would a democrat decline to invite election observers from the EU or the UN, after previously inviting them? Why would a democrat use the advantage of state TV over their opponent? Can you imagine the outcry if Obama were to do any one of these things? And for the really hard questions, you cannot hope to know the answers: you have to use your gut from what you already know about the man. Do we honestly believe this man would have gone quietly, had he lost? And that, with a government machine stuffed full of his own party members, he would not simply have supplied a different voting figure, had his state-of-the-art computer system produced an unpalatable one? The answers to these last two questions we will probably never know, but the fact that we cannot reasonably give a negative to them in all conscience leaves a highly unpleasant taste in the mouth. And then there is the British connection. Labour MPs Jeremy Corbyn Grahame Morris and Diane Abbott, long-time Chávez supporters, have been out in Venezuela for the elections along with such reputable figures as, er, George Galloway and Jody McIntyre. More interestingly, with no trace of irony, Abbott and Corbyn Morris are going in the capacity of “official election observers”. Official observation, naturally, implies unquestionable neutrality. Diane Abbott even went to the trouble of tweeting me from Caracas that she “made a point of saying I wasn’t supporting a particular candidate”. But let’s look at that a little closer, shall we? Abbott is patron of the Venezuela Solidarity Campaign an organisation which claims to be a friend to Venezuelan democracy but, strangely, does not seem to contain a single supporter of Chávez’s opponent, Henrique Capriles. One of its stated aims is “To defend the achievements of the Bolivarian Revolution”, i.e. Chávez’s political movement. In any event, the state apparatus is so stuffed full of Chávez’s party members, and the vital democratic dividing lines between party and state so faint, that anything which supports the Venezuelan government effectively supports the party of Chávez and the man himself. In short, the organisation might as well be called the Chávez Solidarity Campaign. It is also difficult to imagine, had Capriles won, that the VSC would not have immediately challenged the result and campaigned for his ousting. But that last part, of course, is merely speculation. Even in the cognitive-dissonance-soaked world of the far left, it is difficult to countenance the idea these MPs can reasonably claim to be honest brokers, neutral to both candidates. At least Galloway is honest about his love for Chávez; “Chavez fears no-one but God” and “Viva Comandante!”, he tweeted this morning. Finally, Capriles has accepted the election result because, frankly, he has no choice. You cannot choose to stand and then decry the process when you lose. He made his bed, and he has to lie in it, for the good of his country. But that does not mean the election has been free and fair. Neither can we really even know if Capriles would have been a better president than Chávez. But he certainly deserved the opportunity for Venezuelans to find out. The simple truth is you are either fully democratic or you are not democratic at all. There are no in-betweens. You cannot be “almost democratic”. But even if, against all odds, you believe Venezuela have just had free and fair elections, it is simply astounding to find our own Members of Parliament expecting us to accept the story they were acting as observers of unquestionable neutrality. “Why would a democrat use the advantage of state TV over their opponent? Indeed. Imagine if Obama used the power of the Presidency to, say, speak directly to the nation on all channels during prime time whilst seated in the Oval Office. That’s why it’s important to have some balance here! ‘we do not know’ ‘you cannot hope to know the answers: you have to use your gut’ ‘Do we honestly believe’ ‘we will probably never know’ ‘we cannot reasonably give a negative’ ‘It is also difficult to imagine’ ‘it is difficult to countenance’ ‘Neither can we really even know’ ‘merely speculation’ given all your partial assumptions and inferences, as indicated in so much of the articles terminology,are you best placed to rule on neutrality and ‘simple truths’ given your declared impartiality? Also, would love to see evidential basis for these claims “concerns of voter intimidation” “many voters were frightened away from using it” and of course, how you know that “Finally, Capriles has accepted the election result because, frankly, he has no choice.” did he tell you that himself? Perhaps he thinks he lost fair and square. What is your basis for this conclusion? Is it that any other conclusion would contradict your argument? Thank God the “centre-left” is here to tell us that Chavez didn’t win at all. Even though the Chavez victory matches up pretty well to the opinion poll aggregates published in the week before the election. I really do wonder sometimes about some figures within the Labour party. There’s a certain breed of people (always calling themselves “centre-left”, and usually Blairites) that love to talk about socialism but are filled with horror about it actually happening anywhere. The same people that want to spread democracy around the world- as long as people don’t go and vote for the “wrong” candidate! broadcasting the speech of a head of state and a political stump speech, which would never be allowed in the UK or US. So because you don’t like the official observers, and the Carter Centre declined an invitation, Chaves stole the election. You claim the election was rigged, the burden of proof is on you. Rob Marchant the 7-O truther. I was pleased to be an election observer for the Venezuelan elections. My family originate from the Caribbean and I knew that these were very important elections for Latin America and the Caribbean. The region also has an ugly history of American intervention. So anything I could do to make sure these elections were not just free and fair, but seen to be so, I was glad to do. Anything to avoid a repeat of the 2002 Bush-inspired attempted coup. Rob Merchant complains that I and the hundreds of other international observers were not formally trained, did not have an official “check list” and were not “neutral”. But I was an official observer for the first democratic elections in South Africa in 1994. There was no formal training, no “checklist” and you weren’t asked if you were “neutral” as between Mandela and Buthelezi. Nobody queried the good faith of those international observers. The most important thing was that you were prepared to be fair conscientious. Rob accuses me of speaking at a Venezuelan Solidarity Campaign rally in the weeks before the election. I did. But I was at pains to say that I wasn’t going to Venezuela to support any particular candidate. I wanted to see for myself that these were free and fair elections and therefore that there could be no excuse for US intervention. Rob goes on to complain that the electronic voting system scared off voters. And that there was widespread intimidation. In fact there were queues at the polling stations and a record turn-out. In one polling station I visited, in an opposition stronghold, voters were peacefully chanting “We want to vote” This was scarcely the act of intimidated people. The Venezuelan voting system is actually far less susceptible to fraud and impersonation than the British one. There are: no postal votes, no proxies and thumbprint identification. Database partitioning and random programming of voting machines mean voter secrecy. And the voting machine software is reviewed and digitally certified by all the political parties. It is often argued that dissident media is suppressed. But there was anti-Chavez stuff everywhere in the newspapers and on the TV stations. I am, frankly, appalled that the team at Left Foot Forward have let such an ill informed piece of reactionary commentary appear on the website. The recent editorial policy with regard to Chavez has flown in the face of any claims to be either evidence-based or remotely left wing. I suggest that website’s coverage regarding foreign policy be better discussed and analysed in future. My thanks go to Owen Jones and Dianne Abott for their generous contributions to the comments section. Their evident desire to correct misinformation on Venezuela deserves praise. Diane, firstly, let’s take out the emotive language. I do not “accuse” you of speaking at the VSC rally – I observed that you spoke. It is a fact, not an accusation. So, Diane, were you or were you not claiming to be neutral? Why did you claim not to be supporting a candidate when you seem to be a long-time Chávez supporter (indeed you are patron of an organisation which has one of its aims “To defend the achievements of the Bolivarian Revolution”, i.e. Chávez’s political movement.” ) My criticism was simply this: how can you possibly claim neutrality when you are a patron of this organisation? Are you always so charmingly articulate? “The recent editorial policy with regard to Chavez has flown in the face of any claims to be either evidence-based or remotely left wing.” Ah, I see, you mean they published two pieces that disagreed with your view. Absolutely, outrageous. How dare they? I think the conclusion on Capriles is pretty reasonable. How could he claim anything else, once he had agreed to stand? You think he could have reasonably questioned the process? I don’t think so. Ooh, horrors. The Evening Standard, whatever next? Don’t be daft. Ask yourself the question: why would you suddenly reduce the amount of observation when the elections get tight? Bit of a difference between that and the opposition boycott one election, because they don’t trust the system. As recently happened in Venezuela. My point is simply this: you can’t be part-democratic. If you are democratic, you do not abuse state media. Or instil such low confidence in the system that the opposition boycotts. Or have opposition activists murdered. It’s a fair cop, guv. You are not confused, merely silly. Not as silly as saying that the UK has been a democracy for hundreds of years. I take your response to mean that you do not think Chavez is a dictator, although I accept that he does have authoritarian tendencies. If you want to know the sources for those idiotic claims, look no further than the rightwing propaganda against Chavez this “writer” parrots. Speaking of huge differences, if you ignore the context of the dominant powers in Venezuela, very well represented by the rightwing media over there, then you are painting a reprehensibly distorted image of events. Governments in the UK or US have subservient media, not a corporate media that is constantly calling for the government to be overthrown as in Venezuela. An absurd, at best shamefully ignorant and at worst intentionally misleading comparison you make. HAHAHA opposition activists murdered. Rise to the challenge of naming any one country that is “fully democratic” or cringe in abject shame you fraud. Yes, its a bit much when the traditionally fascistic Venezuelan opposition behaves more democratically than someone who purports to be part of Labour. UNASUR not credible….? You began with zero credibility and you’ve now lost even that. It certainly does. The guy is evidently more suited the respectable and intelligent Evening Standard. Let’s improve the piss-poor UK debate on the progress in Latin America for God’s sake. Have you gone from accepting UNASUR is an institution (which you poo-poo) to pretending it wasn’t there? Exactly, that’s why we had a choice between neoliberal, neoliberal and neoliberal last election, and a destruction of the NHS by all 3 parties that no one wants. That’s very revealing of your “impartial” colonialist prejudices. Hundreds of years? Do you have any idea what barbarity European countries have committed over centuries? For shame, boy, for shame. Obviously, hence the dozens of replies the post has generated. Don’t remember opposition activists getting murdered in the UK recently, but hey. Subservient media? You clearly have very little understanding of the UK media, I’m afraid. So, if you were the government, why would you not have a respected international institution observe, so there could be no question? Why would you not want to do that? Apart from, perhaps, the election result might be challenged, and you wouldn’t like that? Yes, I challenge UNASUR. 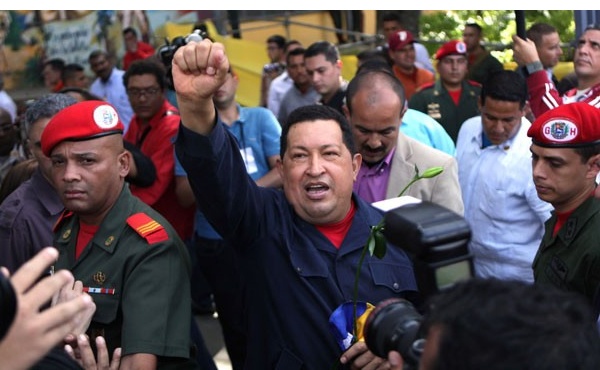 It’s an organisation dominated by Chávez and his allies, as everyone knows. Why not the EU? Why not the UN? Why not even invite the Carter Centre in time, who have been so nice about Venezuela (at least, its computer system) in the past? So you don’t believe that sitting in that office, standing at a podium with the seal of the President on, or, say, putting a banner on an aircraft carrier for a photo-op, represent the use of the accoutrements of state power to burnish one’s own appeal? Really Mr Marchant? When is the last time a major UK media source called for the overthrow of the democratically elected government? How much were you paid? Because your other posts were reasonable, but you’re clearly a paid shill, given that line. You’re too kind. Chavez’s government is known to use paid shills. Ah yes, you also manage to launch an attack on the BBC, it’s almost like it exists or something. They should do, given how frequently we breach international standards for things like the speed of counting of votes. When a terrorist supporter like Galloway isn’t challenged for his support, yes, that certainly does put a major wrench into the works as far as I’m concerned, as a left winger. Ah yes, a typical shill tactic, accusing the opposition of your own unpleasant political views. Labour are centralists, your trying to link them to fachism is downright silly. Several are being bullied by ATOS, and essentially home jailed by withdrawal of support. You seem to think that heads of state shouldn’t do their job and stand up for the policies they were elected for then, I see. Alternatively you’re just another far right anti-BBC hack. Yes, listening to terror-supporters is always enlightening as to their mindset. Know Thy Enemy and all that. Well with Venezuela being in South America chosing UNASUR as an observer is no different to say Italy chosing the EU. The members of UNASUR are all* functioning democracies of 10+ years. * except Paraguay which is suspended due to the controversial impeachment, but that is another story. Rob If you had read my (admittedly lengthy) comment, you would have realised that it is not normally assumed that you have to be “neutral” to be an effective election observer. Most people who were observers at the 1994 South African election were not “neutral” as between Mandela and Buthelezi In fact most of us were long-term ANC supporters. The point was that we all took our duties seriously and prepared to be scrupulous and fair. If that was good enough for the most momentous election on the African continent in my life-time, why can’t the same approach be applied to Venezuela? Sorry. Due to my unfamiliarity with this website I have posted my reply to Rob Merchant ABOVE the message that I was responding to. I hope that doesn’t confuse people! Ok, so if I understand you correctly, you are now saying that you were *not* neutral. I would agree that if you can find some watertight mechanism to truly ensure balance between declared supporters of both sides, that could be acceptable. But why then say you were “not supporting any candidate”, when it was clear that you were? Call me old-fashioned, but don’t those two positions directly contradict each other? I’m sorry but both of you are pretending that Western politicians could get away with what Chávez has done, which is clearly untrue. Even Owen Jones was not defending what Chávez was doing using state TV, merely claiming that the audience figures meant that it didn’t matter. On the BBC, by the way, on the contrary I believe if Venezuela’s TV were a little more like ours, the election wouldn’t have been so clearly skewed.